WATCH The Secret Behind a Better SAT Score? Brianna Letourneau was surprised when she first opened her SAT earlier this month. Letourneau, a senior at Eastside High in Gainesville, Fla. has taken the college entrance exam three times. This time, however the essay question caught her off guard. "I was expecting something much different," Letourneau said. Among the reasons many high school students will long remember their March 12 SAT scores, which are being released today, is because of an essay question that continues to rankle: Do people benefit from reality TV? It's a topic that has sparked debate among students, educators and College Board officials. Some test-takers like Letourneau felt the prompt was insensitive to students who are not allowed to watch reality television shows such as MTV's Real World or ABC's The Bachelor. "If your mom and dad don't allow you to watch reality TV, you're stuck," she said. So what about those students who don't keep up to date with The Bachelor's love life or Snooki's latest social outing? College Board officials say they are not testing the student's knowledge of the essay subject, but rather how they compose their writing. In a statement released by the College Board, Laurence Bunin, senior vice president for operations and the general manager of the SAT Test said, "The central task of the SAT essay is to take one side of an issue and develop an argument to support that position." Using a popular culture reference is not only appropriate, but potentially even more engaging for students," said Bunin. Latourneau feels this gives students who watch reality TV an advantage. "Essay questions are usually more generic. How can you make a strong persuasive argument if you don't know anything about reality TV?" Not all of the test takers, however, felt the question was out of line. Kelly Savage, a junior at Ponte Vedra High School in Ponte Vedra, Fla. was given the same SAT question, but doesn't see why the question would be considered unfair. "Reality stars are 'role models' and the constant scrutiny of their actions will always be a hot topic, and certainly one that the average student taking the SAT should be able to formulate an opinion on," she said. Even though Savage does not regularly watch reality TV she felt the prompt was especially relevant to students her age. "With reality programming prevalent on networks such as MTV and E!, whose target demographic is teens and young adults, it is relatively difficult for students my age to not watch reality shows here or there," she said. Like Savage, Tori Cabot is another teenager who does not typically tune into reality TV. Cabot, a junior at Milton Academy in Massachusetts, took the college-entrance exam for the first time on March 12th. "The thing that surprised me was the topic. I doubted it at first," she said. Cabot worked with a tutor in preparation for the SAT, but says she never came across a question like that one. Although it caught her off guard, she also feels that's the point of this type of test. "They might throw a curveball, but they want to see if you can create a well-crafted essay, no matter what the question," said Cabot. Cabot admits the question was strange, but does not feel the essay question alone will greatly affect anyone's scores. "I'm a little nervous, but not extremely concerned," she said. It's not about the point of view, but rather how the test-taker constructs the point of view, Cabot explained. "There might be some advantage for students who watch reality TV, but students who do not watch reality TV still have an opportunity to argue a point and show good writing technique," she said. Now that scores are released, the debate is bound to continue. 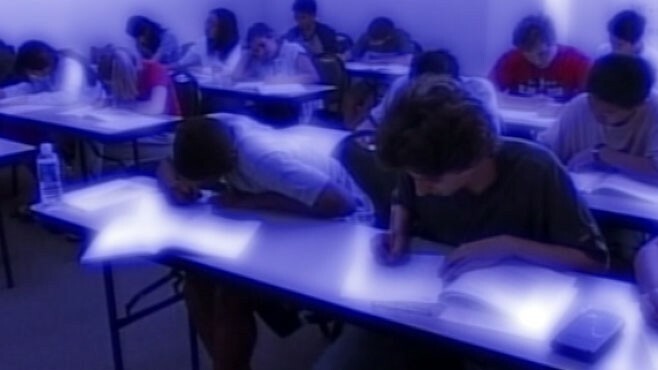 College Board officials feel those who are up in arms may be missing the point. "If presented with a topic about balancing the risk of climbing a mountain with the reward of reaching the summit, for example, a good writer could compose a strong essay without ever having reached the summit of Mount Everest," said Bunin. "We acknowledge that not all students spend valuable hours watching reality television shows, nor are we recommending that students watch these programs." +Do Testing, Hiring Disparities Imply Bias? +Will Education Reform Get Schooled?